When the Volstead Act, which put Prohibition in place, was repealed in 1933. But if you want to revisit that time in a new way, you have your chance because modern speakeasies have popped up all over the country. These bars take the mystery and romance of history and create a fun atmosphere. At Mystery Playground, we love to visit speakeasies when we travel. 1) Individually mixed drinks with fresh ingredients often invented at that bar. We’re talking fresh, muddled fruit and innovative concoctions. A far cry from the quality of spirits found in most speakeasies back in the day. This also means you pay more than you would for an average cocktail, and depending on the city you’re in, it can be a lot more. 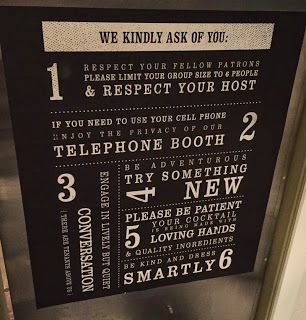 4) An intimate atmosphere with lots of attention from your bartender to help you get exactly what you want. These places are small (thus the need for reservations), and the décor is well planned. Many of the speakeasies even play the music of the time. Located in the basement of another bar, The Drifter gets high marks for the mock Tarot card menu and the entertainment. Also loved the secret door to get inside. Excellent pork sliders and a bartender who breathes fire are not to be missed. Looks like a dive bar, but you won't be able to beat the drinks, conversation and especially the ghost stories.